It’s another solo show this month with Bart chatting directly with the audience. 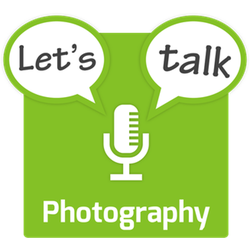 This is the second in what will be a sporadic but on-going series of episodes, each focusing on a different photographic term or concept. This show is all about the related concepts of exposure and exposure value, or EV. By definition, exposure is the amount of light that strikes a unit-area. In photography that means it’s the absolute amount of light that strikes each part of a piece of film or sensor when capturing an image. It’s measured in Lux Seconds (lx⋅s). The exposure is determined by the amount of light in the scene, the size of the opening the light passes through to reach the film/sensor (the camera’s aperture), and the length of time the light is allowed to accumulate on the film/sensor (the exposure time). Note that the exposure is not determined by the size of the sensor. Exposure is a per-unit-area measure because the Lux is a measure of luminous flux per unit area. The brightness of each point in an image produced by a given exposure (number of Lux Seconds) is determined by the sensitivity of the film or sensor to light. In other words, the same scene captured through the same aperture for the same exposure time will produce a darker image on a less sensitive film or sensor, and a brighter one on a more sensitive film or sensor. Rather confusingly, photographers generally abbreviate exposure time to just exposure – this is factually wrong. Remember, Exposure is a measure of the amount of light striking a surface and measured in Lux Seconds, while Exposure Time is just a length of time measured in seconds. This factually incorrect short-hand can exist because photographers don’t make any use of the true concept of exposure in their day-to-day photographic lives. When’s the last time you saw anything measured in Lux Seconds?! What we photographers do make heavy use of is a related concept – Exposure Value, which is measured in EV. EV is a combination of shutter speed and aperture. Specifically, it’s the log to base 2 of the aperture (as a focal ratio or f-number) squared divided by the exposure time in seconds. By definition, an exposure time of one second through an f 1.0 lens gives an EV of 0. Since the scale is both logarithmic and inverted, halving the exposure time (while keeping everything else the same) will increase the EV by 1. This means that, rather confusingly, higher EVs mean darker photos. In photography, 1 EV is often referred to as a stop. So when we talk about darkening an image by two stops, we actually mean a change in brightness of +2EV (remember, it’s an inverse scale, so plus means darker rather than brighter). With a little algebra, you can represent just about anything to do with light in EV – aperture, exposure time, sensitivity, and more. In the pre-digital era there were just two settings under the photographer’s control – aperture and exposure time, but now we have a third – sensitivity. These three together are often referred to as the exposure triangle. Our cameras generally show us exposure times in seconds, aperture settings as focal ratios (f numbers), and sensitivities in ISO, but, all the controls we use to adjust these settings are actually calibrated in EV (this also applies to film cameras). Have you ever wondered why your exposure time, aperture, and ISO settings all change in bizarre-looking sequences? Why does my Nikon D5500 step the exposure time as 1/100, 1/125, 1/160, 1/200, 1/250, 1/320, 1/400, 1/500, 1/640, 1/800? If you only look at every third number you might spot what’s going on – 1/100, 1/200, 1/400, 1/800. Every three clicks of the dial halves the exposure time. In other words, every three clicks of the dial corresponds to a change of 1EV. I.e. exposure times change in increments of on third of an EV, or one third of a stop. Similarly, the aperture settings go from F5 to F5.6 to F6.3 to F7.1 because each of those steps is equivalent to a change of one third of an EV. Finally, as you’ve probably guessed by now, when you’re adjusting your ISO setting, each step is a change of one third of an EV. So – what that means is that if you change the exposure by one click so that it would normally brighten the final image, you can counter-act that by moving either the ISO or aperture settings by one click in the direction that would normally darken the image, resulting in an image with different settings, but with each point in the image having the same brightness. Similarly, if your image is too dark, you can brighten it by the same amount with one click of any of the three settings. Our cameras also use EVs to express relative brightnesses. The exposure compensation dials allows you to brighten and darken images in steps of one third of an EV. The flash compensation dial allows you to add more or less light to the scene in steps of one third of an EV. And, when you put your digital camera in full manual mode, the little in-camera light meter shows how much too bright or too dark it thinks your current settings are in EV. Any desired exposure can be achieved with many different combinations of settings. All such combinations are said to have the same EV.